An easy recipe for a moist Healthy Carrot Bread made with whole wheat flour and lightly sweetened with pure maple syrup. Serve it plain or top it with a light ricotta icing for a special treat! I seem to be in a baking mood lately, it must have something to do with me needing to distract myself from the cooler than usual spring weather and what seems like a never ending winter. But in order to feel less guilty about baking yet another treat, I decided I would make it wholesome. And what better way to make a treat healthier than making one that contains a vegetable! 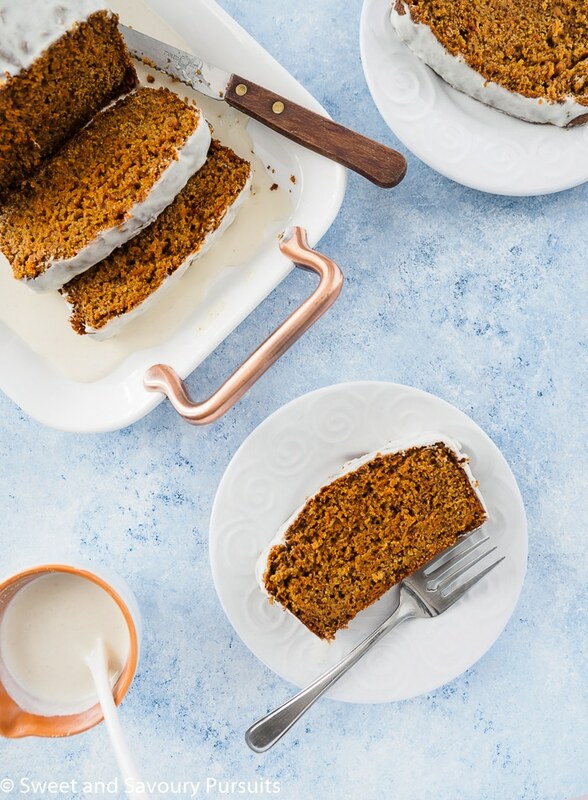 Baked carrot desserts are always so popular in the spring so I decided to make a Healthy Carrot Bread. Making a satisfying and healthy carrot bread is easy if you use the right ingredients! I made this carrot quick bread healthier by using whole wheat pastry flour, sweetening it using only pure maple syrup and using yogurt and just a touch of oil for moisture. The bread came out flavourful, tender, moist and light with just a touch of sweetness. For variety you can add shredded sweetened coconut or raisins for a bit more sweetness. My favourite add-in would be walnuts, they’re great for added texture and crunch. I would stick to 1/2 cup and lightly toast them before folding them into the batter at the end. Since I had a tub of ricotta cheese in my refrigerator and I was going to be serving the carrot bread for dessert, I decided to top it with a lightly sweetened ricotta based icing. But a light dusting of powdered sugar is sufficient to dress up the carrot bread and turn it into a light and simple dessert. You can also freeze this Healthy Carrot Bread (without the icing), either whole or by slicing it up and wrapping the slices individually so you can just take what you need from the freezer and keep the rest for another day. If you enjoy quick breads as much as I do, be sure to check out this Lemon Zucchini Walnut Loaf, it’s one of my favourite spring and summer treats. Enjoy! 300 grams ricotta cheese I used extra smooth, 6% M.F. In a large bowl, whisk together whole wheat flour, baking soda, baking powder, cinnamon, nutmeg and salt. In a separate bowl, adds the eggs and lightly whisk. To the whisked eggs, add the yogurt, maple syrup, oil, vanilla extract and grated carrots. Stir until well mixed. Pour the batter into the prepared pan and bake for 40 to 45 min. With a toothpick or a cake tester, check to see if the bread is done at 40 min, if the toothpick comes out clean or with just a couple of crumbs the bread is done, if not, check again in 3 to 5 minutes. Mine took 40 minutes to bake. Let bread cool on rack for 15 minutes before removing the it from the pan. Remove from pan and let it cool completely to room temperature. If desired top bread with ricotta cheese icing. In the jar of your blender, or food processor, add the ricotta, maple syrup, vanilla extract and if using cinnamon. Blend until the mixture is smooth. Top carrot bread with the icing or serve on the side. Feel free to add in a handful of toasted walnuts, they give a great crunch. Just fold them in to the ingredients once you combined everything together. My high powered blender turned the ricotta cheese into an incredibly smooth and velvety sauce, reminiscent of a crème anglaise. It was not my intention to have an icing I can pour but I ended up really liking it and so I'm sharing the recipe with you. If you would rather keep things simple and on the lighter side, a light dusting of icing sugar will work beautifully. Of course, you could always serve the bread plain. Please note the nutrition facts are for the carrot bread only and do not include the ricotta icing or optional add-ins such as raisins, coconut or walnuts. Carrot bread sounds really cool to try specially after looking at your perfect one!! Looks super delish! A slice of your carrot bread and a cup of tea sound like a nice way to start the morning. I agree, I only wish I could do that more often, weekdays are always so rushed, but that would be perfect on the weekends! Your carrot bread looks delicious, I will give it a try this weekend.